The Nimrod Expedition (1907 – 1909). On December 6th, 1908, as Ernest Shackleton, Frank Wild, Eric Marshall and Jameson Adams scaled Antarctica’s Beardmore Glacier; Socks plummeted to his death, lost to one of the many crevasses that fractured the pathway to the polar plateau. He was the last to die, of the four ponies that had started the southern journey. Many of the unfortunate beasts had perished in Antarctica prior to the loss of Socks, and many more would die on subsequent expeditions, but the death of this particular pony would have ramifications that reverberate to this very day. With each step, each mile and each expedition, the explorers of the heroic age of Antarctic exploration, gradually unravelled the enigmas, of the mysterious white continent. Between the years 1902 and 1911, Antarctica was considered the last great prize in exploration worth striving for. To garner support, and more importantly funding, each expedition sailed with the promise of scientific discovery, but at the heart of all quests was the ambition to be first to stand at the South Pole. In 1901, Robert Falcon Scott’s DiscoveryExpedition, was the first to set off for Antarctica, with the intention of a ‘southern journey’. This was the term the explorers had coined for an assault on the South Pole. Scott’s effort commenced on November 2nd, 1902 and he took with him Third Officer, Ernest Shackleton, the expedition’s junior doctor and zoologist, Edward Wilson, and a party of sled dogs. The Ross Sea Party had been tasked with laying the supply depots, that Shackleton’s Trans-Antarctic team would avail of, having come through the Pole from the Weddell Sea. Of course this would never happen as the Endurance was held fast in the ice of the Weddell, and never even made landfall on Antarctica. As the expeditions second ship, the Aurora sailed to the other side of the continent, through the Ross Sea, and made landfall at McMurdo Sound. They followed in the footsteps of Scott, and laid supply depots across the Ross Ice Shelf all the way to the foot of the Beardmore Glacier. Antarctic Huts – Frozen Time Capsules of the Heroic Age. Scott’s Discovery Hut – Hut Point Antarctica. The story itself is long over a century old, and this television production has notched three decades since its first airing. This is the story of Scott’s Terra Nova Expedition, which was well under way, and southward bound, before Roald Amundsen announced his intention to beat them to the prize, and Scott suddenly found himself a contender, as well as an expedition leader. But most of all it is the tale of two groups of brave men who had ventured into the realm of the unknown, to claim the last place unknown to man – the South Pole. The Last Place on Earth is a 1985 Central Television seven part serial, written by Trevor Griffiths based on the book Scott and Amundsen by Roland Huntford. The book is an exploration of the expeditions of Captain Robert F. Scott (played by Martin Shaw) and his Norwegian rival in polar exploration, Roald Amundsen (played by Sverre Anker Ousdal) in their attempts to reach the South Pole. The series ran for seven episodes and starred a wide range of UK and Norwegian character actors as well as featuring some famous names, such as Max von Sydow, Richard Wilson, Sylvester McCoy, Brian Dennehy, and Pat Roach. It also featured performances early in their careers by Bill Nighy and Hugh Grant. Subsequently Huntford’s book was republished under the same name. The book put forth the point of view that Amundsen’s success in reaching the South Pole was abetted by much superior planning, whereas errors by Scott (notably including the reliance on man-hauling instead of sled dogs) ultimately resulted in the death of him and his companions. British National Antarctic Expedition, 1901–04. Generally known as the Discovery Expedition, The British National Antarctic Expedition, 1901–04, was Britain’s first official foray into Antarctic climes since the 1839-1843 voyage of James Clark Ross, with HMS Erebus and HMS Terror. On 4 February 1902, Robert Falcon Scott’s Discovery Expedition, landed on the Barrier and unloaded an observation balloon, which Scott had brought along for the purpose of achieving aerial surveys. Scott himself was first to climb aboard the balloon and it rapidly ascended to a height of 180 m, but thankfully the balloon was firmly tethered. Ernest Shackleton piloted the second ascent, and as with Scott, the only thing observable even at that height, was the seemingly endless expanse of icy whiteness that constituted the Barrier. The expeditions junior doctor and zoologist, Edward Wilson privately noted that he thought the flights to be “perfect madness”. The Discovery Expedition succeeded in its quest to undertake scientific studies in Antarctica, in fields as diverse as biology, zoology, geology, meteorology and magnetism. On the Western Journey, Antarctica’s only snow free valleys were discovered, in the western mountains of Victoria Land, and became known as The Dry Valleys. The Dry Valleys in the western mountains of Victoria Land, discovered during the expedition’s western journey. 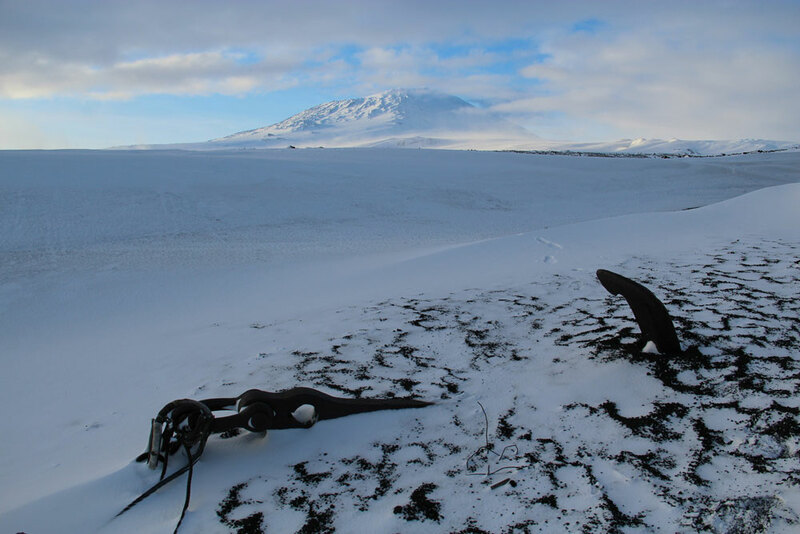 The ‘South Poll’ – Poll 1: Antarctica’s Greatest Hero. Welcome to the first South Poll, which asks the simple question, ‘ Who in your opinion is Antarctic Exploration’s greatest hero?’ For some there is only one stand out hero, but for others, who admire the collective bravery of those who contributed so greatly to the Heroic Age, it is not so clear cut. The list of candidates may not be extensive enough to satisfy everyone, and all are drawn from the period dubbed the ‘Heroic Age of Antarctic Exploration’. Below the poll is a very brief overview of the case for each candidate, and should you have any further argument for or against any of them, then please leave your thoughts, by using the Facebook Comment box. Once you are logged in to your Facebook account, you can comment freely, and please remember you can only vote once, so choose wisely! The poll will run for 1 month. Who is Antarctica's Greatest Hero?